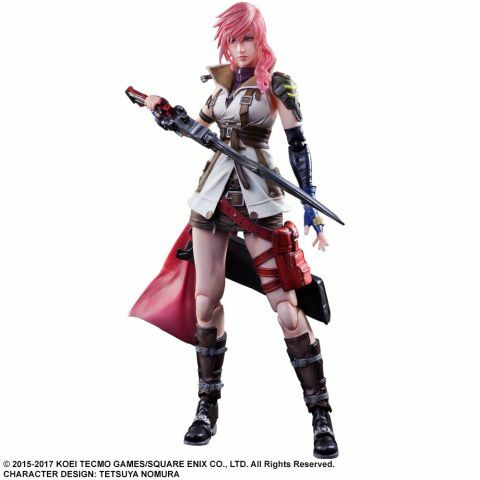 The figure showcases both her feminine side as well as her strength as a soldier, and its flexible form aptly expresses her character. The clear molding used for her distinctive hairstyle reflects the transparency apparent in the original artwork. Additionally, the figure utilizes flexible articulation points throughout and ratcheted jointing in her cape, allowing enthusiasts to enjoy the vibrancy and liveliness of the action figure. The detailed accessories and the Blazefire Saber that comes in two forms - sword and gun - as well as other features help to thoroughly recreate Lightning's charm.